“Poetry is ordinary language raised to the Nth power. Poetry is boned with ideas, nerved and blooded with emotions, all held together by the delicate, tough skin of words”. Poems can help you say, help you show how you’re feeling, but they can also introduce you to feelings, ways of being in the world, people, very much unlike you, maybe even people from long, long ago. Regarding its structure, a poem consists of three levels: the phonetic and the semantic one, as well as the level of its form. Each one of these levels is characterized by a range of features that determine the interpretation of a poem. More precisely, its form consists of stanzas and lyrics; the phonetic level has to do with meter, intonation, prosody, rhythm; and the semantic level refers to genre, words, sentences etc. In terms of this, a poem is a rather dynamic system with complex structures, and its analysis may be done by following different criteria: geographical, social, historical etc. (Abdul-Rahman et al. 2013, 381). How about seeing poetry from a different perspective; view poetry far away from its traditional interpretation and analysis? An analysis that is based on computer algorithms and visual mapping? Poem Viewer is changing the way we analyze a poem by visualizing poetic features and maybe it is changing the way we perceive poetry in general. 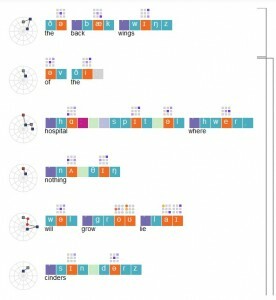 “Poem Viewer is a web-based tool for visualizing poems in support of close reading”. Close reading is based on identifying characteristics of a poem and its association with a variety of features, linguistic, literary, sociological, historical, etc. 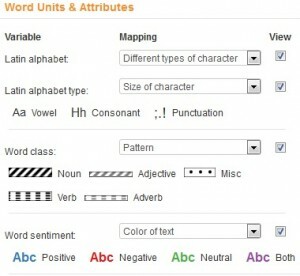 As K. Coles and J. Lein (2013) assert “close readers engage texts directly, intimately and in detail; they trace the finest interactions among such literary features as rhyme and meter, sound, figures, and syntax, noting how even the subtlest movements and operations (a comma, a repeated vowel, etc.) influence a reader’s interpretation(s) and experience(s) of a particular poem”. Poem Viewer is designed so that the user possesses a central role, by giving him two main options: either to create poem visualization by uploading a poem automatically or manually, or examine sample visualizations that already exist. The database already contains 91 poems, for each of which exists a visualization map that analyzes the poem phonetically and semantically. The aim of this tool is to allow the user to detect the variables in a poem and its significance lies in the variety of poetic variables that can be used in order to visualize a poem and the utilization of rule-based mapping to visualize these variables. For each poem is being given a visual map consisting of variables, which are divided into two basic categories: the semantic and the phonetic. Some of these variables is the repetition of a word (repeated word) that indicates the number of times that a word is being repeated, or, the phonetic type which shows if it is a vowel or a consonant etc. These variables correspond to certain mappings of a poem, which can be handled by the user via a control panel. The control panel allows the user to choose how many and which variables will be selected for the visualization of the poem. In these terms, one poem can be visually presented into two sections: the phonetic and the semantic section. The phonetic variables are being composed by three regions: the Phonetic Units and Attributes, the Phonetic Features and the Phonetic Relations. The semantic variables are being composed by two regions: the Word Units and Attributes and the Semantic Relations. So, all of these consist of five sections. Each of the regions mentioned above may have a number of visual options to choose from. Phonetic Units and Attributes have seven variables which lead to different mappings: phonetic types, vowel length, syllable break, sound frequency etc. Phonetic Feature shows the position of vowels and consonant features (voiceless and voiced), while Phonetic Relations signify the type of relation: rhyme, end rhyme, alliteration, assonance, consonance, and their frequency. Word Units and Attributes offer Latin alphabet type, word class (noun, verb, verb etc.) and sentiment, and Semantics Relations offer visualizations of repeated words and their frequency. Layout may be chosen to be either Horizontal or Structured, and the use of Macro-glyphs offers mappings of vowel positions (Abdul-Rahman A., E. Maguire, M. Chen 2014). A Structured Layout. An image of Macro-glyphs. In conclusion, Poem Viewer deploys visualization tools profitable to close readers of poetry. It is a shining example of the application of digital humanities and the collaboration between Computer science and Humanities by bridging the gap between them. Abdul-Rahman, A. E. Maguire, M. Chen. 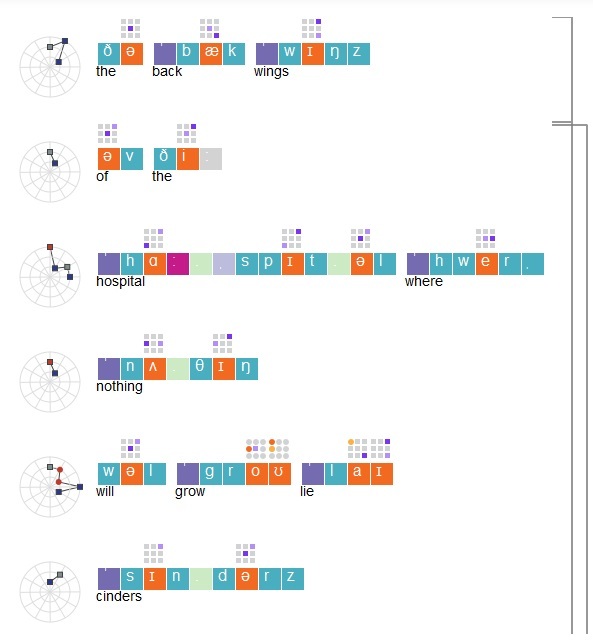 “Comparing Three Designs of Macro-Glyphs for Poetry Visualization”. Proceedings of The Eurographics Conference on Visualization (EuroVis 2014), 9-13 June 2014, Swansea, Wales, UK: 2014. Abdul-Rahman, A. et al. “Rule-based Visual Mappings – with a Case Study on Poetry Visualization”. Computer Graphics Forum. 32. 3 (2013): 381-390. Coles, Katherine, and Lein Julie Gonnering. “A World in a Grain of Sand: Uncertainty & Poetry Corpora Visualization”. YouTube. September 2012. 13 September 2015. <https://www.youtube.com/watch?v=YJLSbbNDMbM>. “Poetry.” The New Princeton Encyclopedia of Poetry and Poetics. 1993. Wiki’s Political Point of View?